We are innovators. We are the leaders in Microsoft technologies, content management and enterprise development. We provide leading edge professional services, technical solutions and mission critical advisory to clients across the globe. We thrive on discovery and change, working to make lives better- for our customers as well as our team members. Our valued team members are bright, talented and committed technical leaders focused on providing the best services and solutions available. 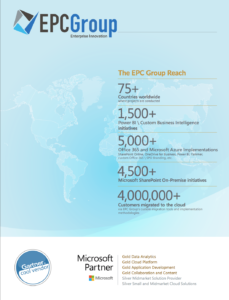 EPC Group’s dynamic and ongoing company growth provides opportunities for personal success and professional advancement that are not found elsewhere. EPC Group is an organization with an entrepreneurial mindset that maintains self-motivated thought leaders that dedicate themselves to the success of every client and team member. Our team members are our most valuable asset. The breadth and depth of our team’s expertise is directly reflected in the long term partnerships we maintain with our clients. Over 75% of EPC Group’s business is composed of reoccurring clients that have truly partnered with our organization over many years. As an organization, we strive to create a long-term professional home that meets each team member’s personal and professional goals. We offer work-life balance and the flexibility to meet life’s demands. We offer home office environments to our team members and truly work together and support each other to help handle what life throws your way. All team members at EPC Group are considered invaluable and a critical piece to our overall success. We work hard for each other and our customers and because of all that hard work we are able to flourish and maintain a team composed of the brightest and best in the industry. If you feel you could help us take our organization to the next level and are looking for a career home then you found the right organization! Email us your resume at careers@epcgroup.net and we will contact you as soon as we can. We are looking for exceptional students or recent graduates in computer science, information systems or a related field. Individuals who are passionate about technology, think analytically and communicate clearly. If this sounds like you, please contact us today to learn about our internships and entry-level positions.